Web design plays a crucial role in the functioning of a website that targets the job seekers and recruiters alike. The design should not only allow seamless job search for the job seekers but also empower the recruiters to post their requirements and find the best talent based on their requirement. The web designers at WeblinkIndia.Net, a leading web design company in India, incorporate the latest trends of the web design industry and the recruitment industry to design visually appealing and engaging websites. With an experience of over 18 years and a noteworthy track record, we are a reliable destination for availing Jobs & Recruitment Website Designing Services. At WeblinkIndia.Net, we have a team of professionals who possess the knowledge required for making a Recruitment Site. This team has handled a countless number of projects for companies in this industry with 100% client satisfaction. The Jobs and Recruiters web design helps the candidates to find job opportunities quickly, and recruiters to find suitable candidates with just a few clicks. As a recruiter, you can easily browse through a number of suitable candidates for the post and add the relevant ones to the list. 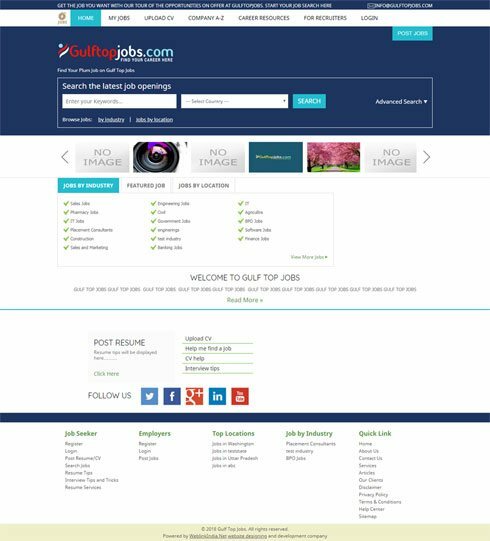 With the jobs and recruiters website designed by us, you can easily add, edit or delete jobs on the site. Plus, there is archive facility as well as advanced search facility in the live vacancies. The candidates can easily narrow down the extensive number of jobs available on the basis of preferences using filters, thereby, getting the most suitable options. We understand that a Recruitment Website requires catering to employers as well as jobseekers. This understanding is reflected in our design as well as the written content. Maha Free Job Alrt is a reliable platform that is acknowledged for providing the best job opportunity to the job seekers. A job seeker can search different jobs by particular industry and city. We also provide job opportunities in government sectors. We are associated with well-known companies and can provide complete details of diverse job options in both private and government sectors. Browse our website for the best job opportunities. Our website is developed and managed by WeblinkIndia.Net Pvt. Ltd., a well-known website designing and developing company. Medline Recruitment was founded by a group of doctors having years of experience. It is a corporate member of Recruitment and Employment Confederation (REC) and strictly adheres to the standards set by REC code of professional Practice. The recruitment consultants at Medline are expert in handling the recruitment challenges that the clients encounter and accordingly provide the best possible solutions. WeblinkIndia.Net, a well-known name in SEO, has done the Website Designing, Website Hosting and Web Development for Medline Recruitment. 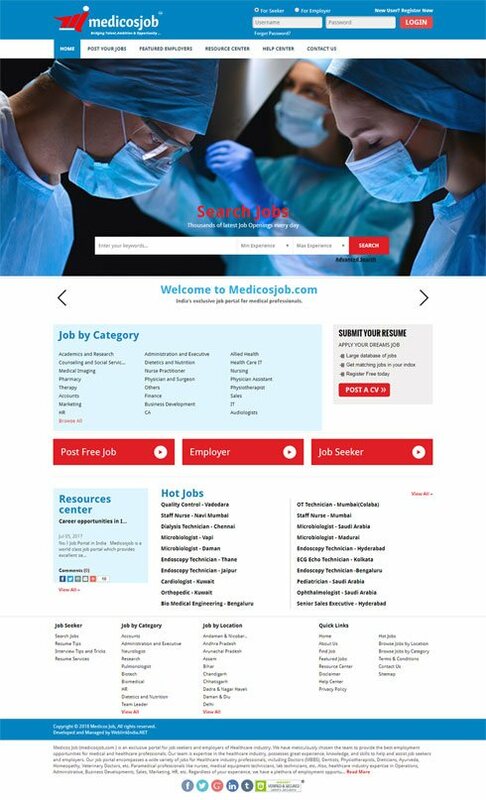 Medicos Job or medicosjob.in is a special portal for employers and job seekers of medical domain. With this, we act as a bridge between aspirants & employers and provide plethora of a employment opportunities depending on the qualification of job seekers and requirements of the companies. With a team of diligent workforce, we are providing comprehensive opportunities to medical and healthcare professionals. 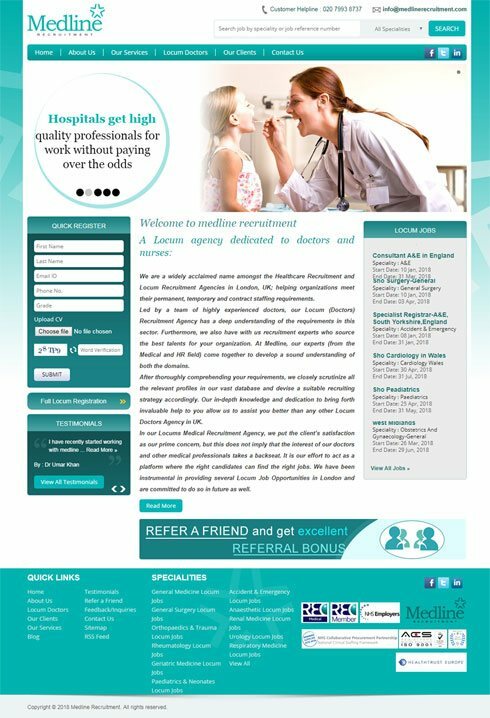 With our job portal, we provide a wide variety of jobs for medical personnel including Doctors (MBBS), Dentists, Physiotherapists, Dieticians, Ayurveda, Homeopathy, etc. To know more about our services, feel free to visit us through website that is designed and managed by WeblinkIndia.Net Pvt. Ltd. Choose WeblinkIndia For Jobs & Recruiters Web Design – Here’s Why?